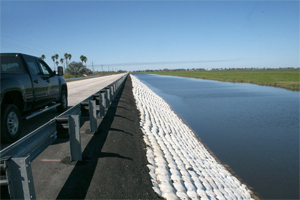 Geotextile erosion control systems are increasing in popularity because of the easy, low cost installation and long lasting protection against Hurricane Storm Protection. Our GeoTextile Concrete Filled Mats are being used worldwide, performing superbly even in highly severe applications. They have out-performed older methods of erosion control and proven to be the superior method for erosion control on concrete slope paving and rip rap. Thousands of successful installs, coupled with extensive testing of our GeoTextile products have shown that our fabric-formed concrete erosion protection methods are superior to any other method, including older method. Our concrete linings and mats offer superior stability in Hurricane Storm Protection dealing with high velocity flows. GeoTextile fabric-formed concrete works better than rip rap and concrete slope paving eliminating the uplift forces with it's flow through pores. The flow through process slows channel speeds. The Fabric Formed Concrete can assume the shape of the ground underneath the mattresses or linings which in turn reduces underscour. Uplift pressures are more damaging to more traditional methods of concrete applied to slopes such as poured concrete or rip rap and more likely to fail. GeoTextile linings and concrete mats can be shaped with built-in drainage, and the ground underneath is more likely to remain stable with less underscore. Filling the GeoTextile fabric forms sections with concrete at the job site have the concrete means they easily conform to the underlaying ground, which means a tighter bondwithout underscour. The fabric perimeters and embedded cables conform to the changing contours of the ground. Our GeoTextile fabric forms systems are delivered to the jobsite ready to be filled with concrete using a small line concrete pump with no further forming required, having the required depth and contours already built into the forms. Because there is no steel reinforcement or finishing required, manpower costs are minimal. 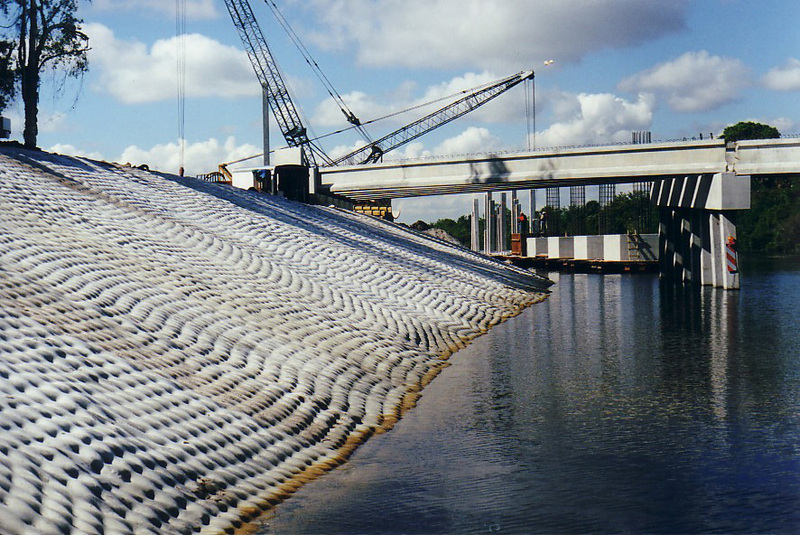 As an added benefit with Hurricane Storm Protection breakwaters, GeoTextile fabric concrete mattresses can also be installed over GeoTextile tubes without need of first dewatering the tubes. GeoTextile fabric forms are lightweight and inexpensive to ship throughout the Caribbean and Bahamas Islands because the concrete, which has the weight, is inserted on-site after shipping using local concrete. Tools need for installation are a few common construction tools and a concrete pump. In addition to the ease of nstallation, concrete can be pumped to the fabric forms from a distance of up to 800 feet. our concrete filled fabric forms is cost effective for any size job. Shipping is less, manpower is less, and equipment for installation is minimal, making this method the ideal method of erosion control or breakwater armoring. This method of Hurricane Storm Protection erosion control and breakwater armoring has seen phenomenal growth and compete strongly with older methods such as rip rap and rubble mound, and once armored, are believed to last just as long. Concrete Fabric forms fit easily into the environment with little disturbance to aquatic and plant life. Additionally, GeoTextile linings and mats do not have dangerous juttings that could harm people, mammals, animals, vehicles, or boats.